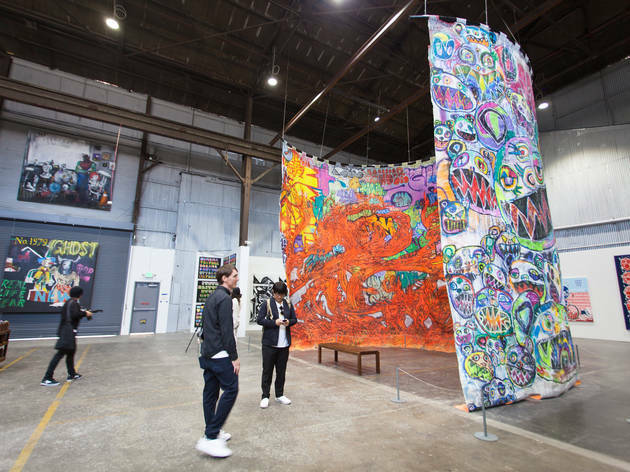 Author and historian Roger Gastman put together MOCA’s popular 2011 street art retrospective, “Art in the Streets.” Now, the graffiti authority is back to curate another massive exhibition, set to take over a spacious warehouse on the northern edge of Chinatown. “Beyond the Streets” celebrates the evolution of the artform with works from over 100 artists. 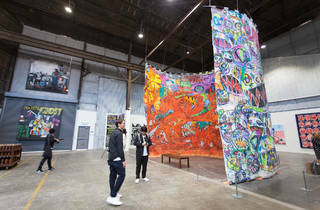 Site-specific installations include large-scale banners from feminist activists Guerrilla Girls, a playable handball court decorated by Lee Quiñones, a sprawling double-sided painting by Takashi Murakami that encircles visitors and FAILE’s Temple, an interactive construction of ceramic, steel, mosaics and prayer wheels. The show also features L.A.-inspired installations, including a recreation of griffiti and skate destination Venice Pavilion, in partnership with adidas Skateboarding, and an outdoor garden installation by Ron Finley, known for his “gangsta gardening” projects to bring food sources back to inner-city communities. The touring exhibition debuts in L.A. on May 6 at Werkartz (1667 N Main St) and runs through July 6. Timed tickets cost $25. I'm a huge fan of the temporary exhibits that keep popping up around town, and Beyond the Streets does not disappoint. There is something to take in at every corner and a lot of the pieces allow for you to interact with them. The only thing I would suggest is to not go on a very hot day, ventilation isn't the best, but this is an exhibit you shouldn't miss.